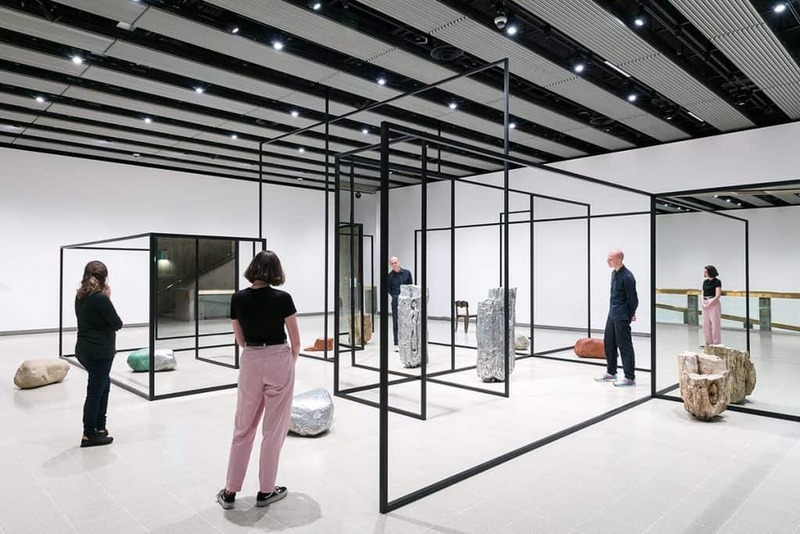 The Hayward Gallery's newest exhibition, Space Shifters, includes works from the infamous Yayoi Kusama and Richard Wilson and urges guests to reimagine their physical surroundings. We are about 90 minutes into the pre-launch media view of Space Shifters, the Hayward Gallery’s mind-bending winter sculpture exhibition, and already there is a clean-up in the first floor gallery. Someone has disregarded the ‘no touching’ rule at Richard Wilson’s iconic 20:50 installation and put their hands directly into the colossal tank of recycled engine oil, causing gallery staff to shut down the exhibit for a few minutes while they get busy with the wet wipes. Most fans of contemporary art would be familiar with Wilson’s piece, which was unveiled in 1987 and on display at the Saatchi Gallery as recently as 2015. And you certainly don’t have to be culture vulture to know the general rule of thumb; enjoy art with your eyes, not your hands. And yet venturing out on that platform to peer down into the viscous liquid, which fills the tank to the millimetre and offers a mirror image of the room, I had to quash the very strong compulsion not to reach down into the seemingly empty abyss myself. 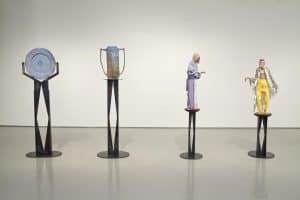 This is not the first time you will have to fight the urge not to touch one of Space Shifters’ 20 pieces, which range from historic sculptures from the 1960s through to immersive, site-specific installations commissioned specifically for the exhibition. There’s Roni Horn’s coffee table-sized lozenge Untitled, which seems to emit a sort of warm kinetic energy from deep within its lilac cast-glass centre. Reflection using mirrors: Alicja Kwade’s Weltenlinie features in Space Shifters. Leonor Antunes’ new commission also beckons, a colossal dream catcher of delicate brass shapes dangling from the ceiling. And Alicja Kwade’s WeltenLinie is downright disorienting; a steel maze of rectangles framing open space and double sided mirrors with objects placed about in a game of ‘Now You See Me’. Mirrors dominate throughout the exhibition, which is perhaps unsurprising given their role in forging and altering perceptions out in the real world. 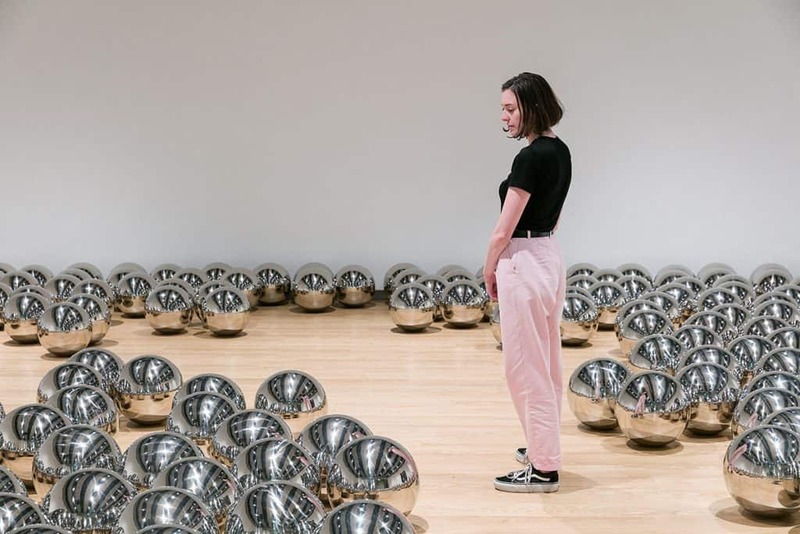 Yayoi Kusama’s celebrated Narcissus Garden scatters hundreds of reflective stainless steel balls around the lower gallery, while Jeppe Hein’s huge rotating mirror suspended above the entrance groups visitors together in one reflection as they wander in and out of the frame. Outside on the sculpture court, Anish Kapoor’s Sky Mirror, Blue uses a concave dish to reflect and invert the sky and surrounding architecture and washing it with blue. It is mesmerising. The curtains block the path of the exhibition, not only forcing visitors back to reality for a split second as they pass through, but also transforming the space on the other side. Felix Gonzalez-Torres’ beaded curtain on the second level of the exhibition delivers a similar effect. You don’t reach Wilson’s installation until close to the end of the exhibition, which by this point has thrown up a few too many optical illusions for one to be sure of anything. Hayward staff might want to stock up on the wipes.